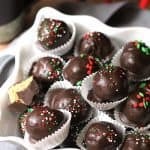 My mom made peanut butter balls for us at Christmas time when we were kids. She always had several containers of holiday treats and would put together trays for parties or as gifts for the neighbors and parish priests. Besides peanut butter balls, her specialties were toffee, turtles, sugar cookies, peanut clusters, and peanut brittle. 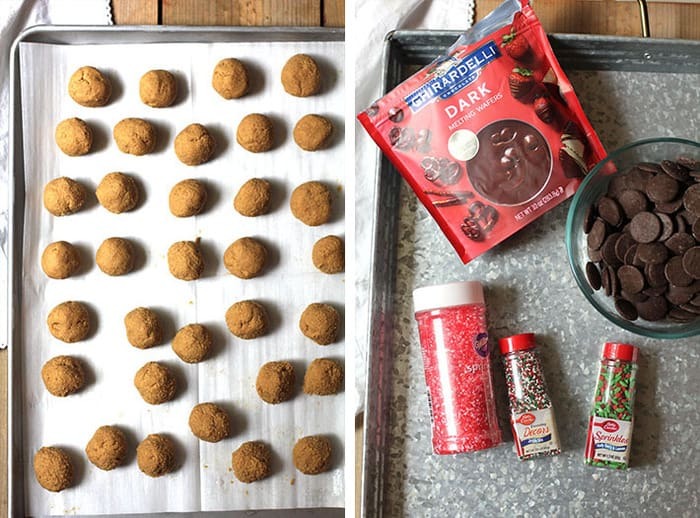 I’m not a peanut butter and jelly girl, but I love the flavor of peanut butter in cookies, bars, and especially THESE no bake peanut butter balls. Make sure you refrigerate the mixture before forming into balls. Even then, you will probably need to put the balls in the freezer and then reform them slightly. The mixture is quite sticky so freezing it will make for easier handling. 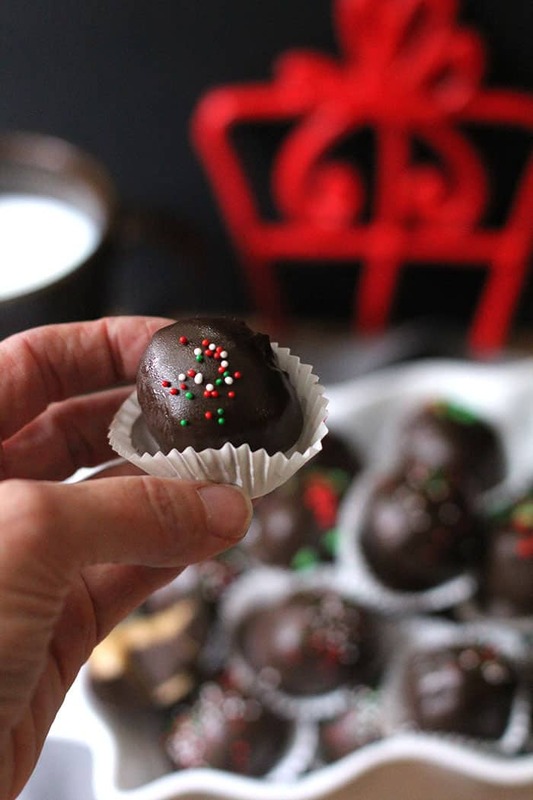 After the peanut butter balls are nice and cold, melt the chocolate and dip them. Follow that by a few sprinkles, making sure you add the sprinkles immediately after dipping because the chocolate sets very quickly. is what I use to tap the extra chocolate off of the peanut butter balls. You might have noticed that I’ve been on a big baking kick as of late (and THIS recipe happens to be NO BAKE). I absolutely LOVE this time of year, and nothing makes me happier than to create some fun holiday treats for my family and friends, including ALL of you. I really hope you’ll try some of my recipes above! I’d love to hear what you’ve enjoyed!! Merry Christmas! In a food processor, add graham crackers and pulse until you get course crumbs. In a large standing mixer (or use a bowl and a hand mixer), combine the graham cracker crumbs, peanut butter, powdered sugar, vanilla, and softened butter. Cream together. Form into approximately 34 small balls and place on baking sheet. Place in freezer for 30 minutes to make them easier to handle. 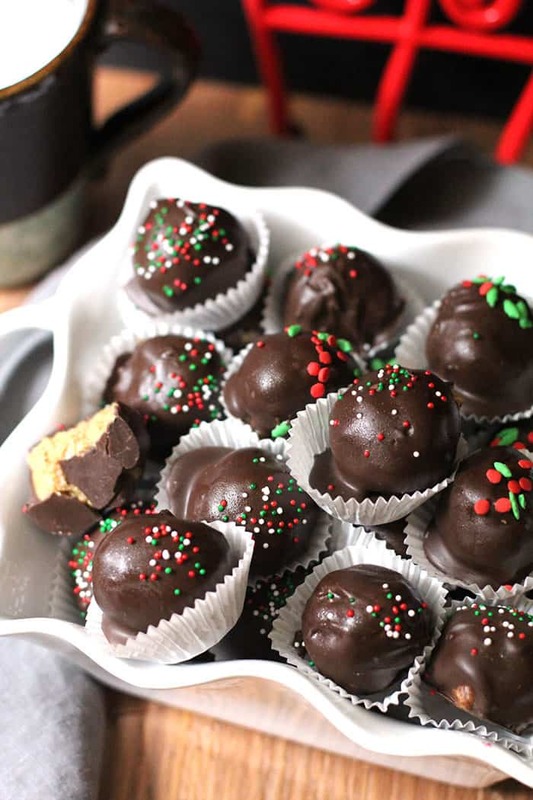 Roll the cold peanut butter balls into nice, even shapes. Melt chocolate wafers in microwave. Dip peanut butter balls in chocolate, and place back on baking sheet. Add sprinkles as you go so they stick to the chocolate. For best results, store these peanut butter balls in the refrigerator. They can also be frozen, in an airtight container, for up to three months. yum! 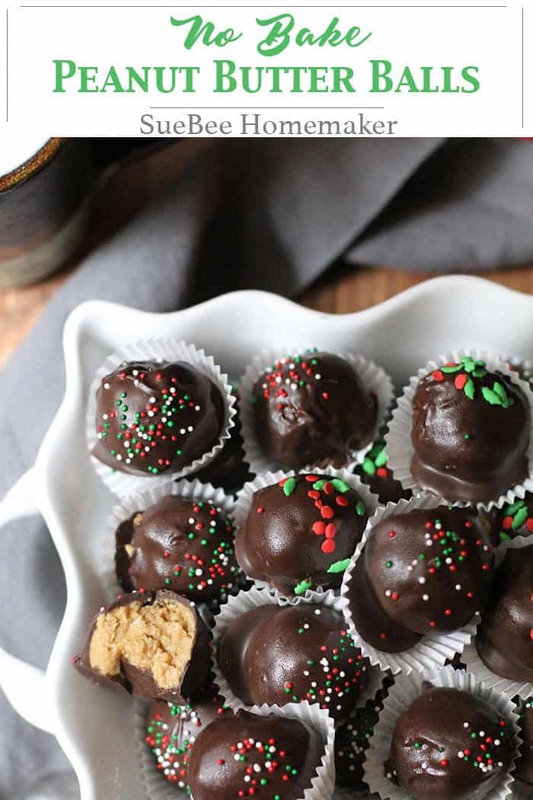 i love peanut butter balls and these look absolutely delicious! can’t wait to try them for Christmas! Besides the awesome taste, these bite size balls never leave you feeling guilty for having ☝️ or two. ????????❤️. Win Win!